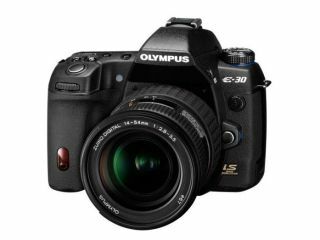 Olympus today announced a new camera to its line-up, the E-30. Bridging the mid-range gap in the company's camera range – sitting nicely between the E520 and E-3 – the camera boasts a 12.3MP sensor and offers in-body image stabilisation and Live View. The LCD screen is a suitably sized at 2.7 inches, and can be flipped out just like you can with a camcorder. The camera also comes equipped with an 11-point autofocus function. The major factors that point to the camera's mid-range positioning, rather than the high-end, are the 'Art Filter' shooting modes, which include Grainy Film and Pop Art – most professionals would baulk at using these filters, preferring to manually tweak images. ISO is passable at ISO 100 to 3200. The camera is also the first by Olympus to boast the company's new Micro Four Thirds System. It isn't the first Micro Four Thirds camera, however, with Panasonic announcing its Lumix DMC-G1 earlier this year. Made in collaboration with Panasonic, the new imaging chip means that camera DSLR chassis can be made smaller, without any degradation to image quality. There's no word on a UK release, but the US should see the camera launch in January for $1,299 (£820).